With all of the warm weather that we have been having lately I was thinking spring while contemplating my Easter menu this year. 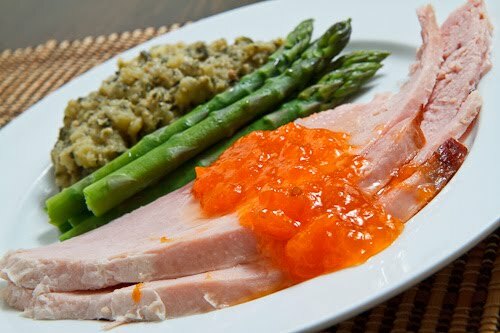 Ham is one of my favorite meals to serve for Easter and with spring on my mind I was thinking about a ham that was glazed with a light and fruity apricot glaze. I have used similar apricot preserve and mustard based glazes with other meats and I was looking forward to trying it out on a ham. Given that it takes a while to cook a ham it is perfect for weekends and holidays and despite taking so long they are actually pretty easy to cook. Even though the asparagus in the store right now is not local, I could not resist picking some up as asparagus just screams spring. I had a bunch of meyer lemon pesto left over and I decided to finish my meal off with some meyer lemon pesto mashed potatoes. The apricot glazed ham turned out really well! The sweet and tangy apricot glaze worked wonders with the salty ham and it does not hurt to whip up some more of the glaze to serve with the ham as a sauce. This meal certainly has got me thinking about warmer days, but until then I now have a ton of leftover ham to enjoy and I have to say, that the leftovers are one of my favorite parts of a ham dinner! Place the ham cut side down in a large baking pan and cover in foil. Bake in a preheated 250F/130C oven until a meat thermometer read 130F, about 3 hours. Cut crisscrosses around the ham in 1 inch intervals and stud the ham with cloves in the intersections. Mix the apricot jam, brown sugar, mustard and orange zest and glaze the ham with 1/4 of it. Continue to bake the ham until it reaches 140F, about and hour, basting every 15 minutes. Remove from oven and let rest before carving. A wonderful dish for Easter! I wish my family were having THIS for dinner! The sweet and salty must have been amazing together. I wasn't even tempted to look at the green blob recipe. One of the ONLY times I can say this. Usually everything is mouthwateringly enticing. Meyer Lemon Pesto mashed potatoes and glazed ham what an excellent combination. Apricot is a great idea for a ham glaze. I should send this post to my mother before she makes the Easter ham. I need to check out that meyer lemon pesto too. Yum. Love the apricot glaze, sweet and delicious Kevin!